The Eastern Prickly Pear Cactus is unique in many ways. The name Opuntia humifusa translated from Greek actually means "spreading cactus-like plant". This plant does not have the morphology of what most would consider a "typical cactus". This particular cactus has flattened paddle shaped appendages covered with sharp spines. Its flowers are bright yellow and it also contains an edible, bright red fruit. It is also unique in the fact that it is found naturally in Wisconsin and other Northern regions, not in the desert as one typically expects. 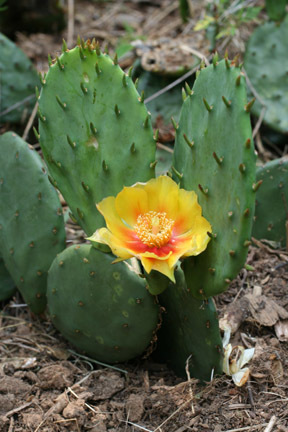 Feel free to explore this site to learn more about the Eastern Prickly Pear Cactus or check out multipleorganisms.net to learn about other organisms.